Nontsikelelo Mutiti kicks off with a talk on women in self-publishing featuring Yolanda Sangwena (Afripop Magazine), Amy Sall (SUNU Journal), Ali Rosa–Salas (Top Rank Magazine) and Jessica Lynne (Arts.black). Mutiti is a Zimbabwean-born artist and educator. She has been a resident artist at the Museum of Contemporary Art Detroit (MOCAD), Recess as well as the Centre for Book Arts in New York and is currently Assistant Professor in the New Media Department at State University of New York, Purchase College. Ali Rosa-Salas is an editorial Assitant at Top Rank Magazine and curatorial fellow at MoCADA. She has produced exhibitions, event series and public programs for AFROPUNK, Barnard Center for Research on Women, Myrtle Avenue Brooklyn Partnership, TOP RANK Magazine and Weeksville Heritage Center. Yolanda Sangweni is a South-African born writer/editor and cultural curator. Currently, she is the entertainment editor of ESSENCE.com and the founder of afriPOP, an online destination highlighting what’s new and what’s next in global African culture. Amy Sall is a researcher and writer and the founder and editor of SUNU: Journal of African Affairs, Critical Thought + Aesthetics. Jessica Lynne is a writer and arts administrator. 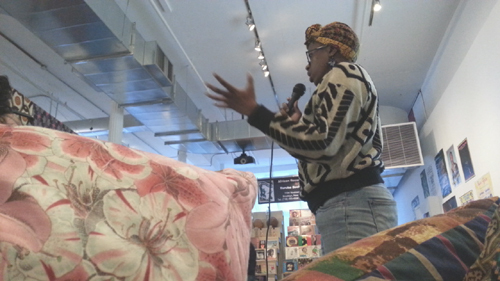 She is also co-editor of ARTS.BLACK, a platform for art criticism from Black perspectives.